iPods have become the entertainment hub of modern life. An iPod dock lets you connect your iPod to other devices so you can listen to your MP3s through speakers. This guide helps you understand which iPod docking station suits your needs. What Is An iPod Dock? 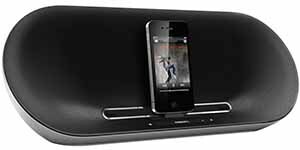 An iPod dock — otherwise known as a docking station — connects your iPod or iPhone to different devices, so you can listen to your digital music through iPod speakers. Some will also offer charging capability for your iPod. What Are The Different Types Of iPod Docks? The most important thing to look for when buying an iPod dock is compatibility. Different iPod types — touch, nano and shuffle — require different connections. The size and shape of iPods has changed with each generation, so some won't fit certain docks. Look for an iPod dock that fits your model. Adapters allow you to fit different iPods. Some docks allow you to connect two iPods at once. Can I Connect Other MP3 Players? To connect another brand of MP3 player, a 3.5mm audio-in jack usually does the trick. This allows you to play music through the speakers, but won't charge the MP3 player. Speakers: Look for an iPod dock with the best quality speakers you can afford. Listen for rich sound, with plenty of bass. Speakers shouldn't sound "tinny" or have an echo. There should be no crackling or popping at higher volumes. Controls: Ensure the buttons are easy to operate and work with your iPod menu. Some iPod docks come with a remote control that can control your iPod menu. Some use a hand-held Bluetooth module that allows you to attach your iPod and use it like a remote control. Take your iPod dock poolside or to the garden. Portable iPod docks should be compact and ideally have an easy-to-carry handle. Look for a dock that takes both battery and mains power. A rechargeable battery will keep long-term costs down and have less impact on the environment. There are also many wireless speaker options that can access your music in either one or multiple areas of your home. A major factor that will reduce your system's sound quality is the quality of the MP3 files on your iPod. Use the best quality audio files you can access. The iTunes music store standard (128kbps AAC) should be adequate. For better quality load music as iTunes Plus tracks (256kbps). Listen to your iPod while gardening or washing the car. Portability: Small in size with easy-to-carry handles. Power: Ensure the dock can be powered by batteries; rechargeable is best. Fall asleep, and wake up, to your favourite playlists. Size: Ensure the dock can fit on your bedside table. Alarm clock: Just like on a bedside table. Blast your tunes through the house, direct from your iPod. Type: Look for powerful, high quality speakers that fill a room with sound; consider a 7.2 channel surround sound A/V receiver. Remote: Control the tunes from across the room. Video outputs: Watch or share either photo or video content from your iPod on your television (only available on selected models). Connections: Ensure your iPod is compatible with the dock. Speakers: Look for rich sound, with no "tinniness" or crackling. Power: Look for battery power and mains-power if you need portability.